AFB is Alive and Kicking, and so is DC Direct's 13" Alan Scott! First off, apologies for the long gaps between updates this month. 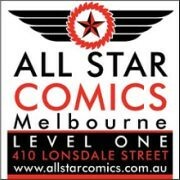 I've just survived a huge interstate move, which means that from now on Action Figure Blues will be coming to you from Melbourne, Australia, instead of our national capital, Canberra, where I've lived for the last seven years. It's a welcome move and an exciting one, but there is obvously much to be done, not the least of which is the rather horrifying task of packing up the AFB Collection. I was "instructed" that I could only work on this task after the rest of the house was unpacked and settled (I love you Mrs AFB!) and this has been a great motivator to get things done. Tomorrow I begin the task of unboxing and reorganising, which I am approaching with equal parts excitement and dread. I'll get some photos up once it's done. Thankfully, I do have a stockpile of items photographed and ready for review, and now that we have the internet connected to the new house (an ordeal of its own!) I'll be doing my best to try and get through them and to get back to bloggingl! 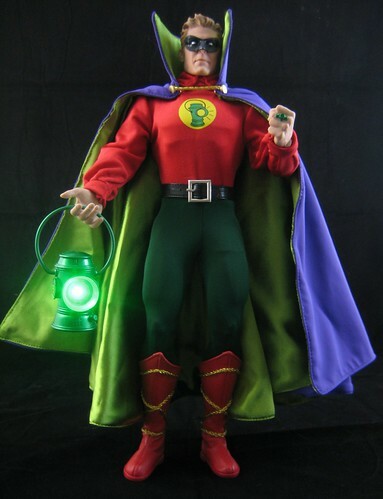 First up is what, at present anyway, seems to be the last figure I'll be buying from DC Direct's 1:6 Scale / 13" line: Alan Scott Green Lantern. Even at first glance, it was clear to me this was easily going to be one my favourite figures in the line. I was very pleased when this was solicited, partly for the love of the character, but also to see that the "Golden Age" Flash, Jay Garrick, wasn't going to be without a friend in this line. The choice to style them in the younger years was a great one as well - we have enough toys of the older Jay and Alan and it was great to see that they'd been captured in their prime at this scale. There are elements of the DCD 13" male body that can stand out as weaknesses depending on the individual character's costume, the most significant of which are the thigh cuts which can be quite noticeable under some uniforms. There's alot happening with this figure, and the thigh cuts thankfully aren't a distraction here. As well as a busy colour scheme, there are a number of fabulously done costume elements, not to mention the truly fabulous headsculpt, that catch the eye instead. A fantastic touch is the light-up feature on Alan's lantern. I have green and other colour lanterns up the wazoo thanks to DCD's prolific production of them in many scales, so it's nice to have one with a difference. As you can see, it's quite bright for a toy and photographs well. There has also been an improvement in the design of the removable mask, which sits very snugly on GL's face and won't pop off like some of the earlier figures in the line (I'm looking at you, Robin). The only niggle I have is the same as the issue I had with the GA Flash figure, and that;s the belt. It's not fixed to any part of the uniform, and so it can ride up fairly easily to expose the seam between fabrics underneath. A small issue that in no way overshadows what truly is a brilliant feature. You can see more photos at Facebook, discuss this at the AFB Forum, and comment on this post to enter the December AFB Comment of the Month Contest! Glad to have you back and posting, and all the best for settling in after your move! After this review, I think there is a 13" Alan Scott at my comic shop that is going to be coming home with me if he's still there. I've kind of been ignoring this line of late after some disappointing releases and repeat characters, but you're right that this one is a true standout. Thanks! In an ideal world they would make the perfect version of a bunch of characters in this scale. Imagine a collection of the legion of superheroes in some fancy cabinet with highly detailed costumes. Ah to slepp purchance to dream. congratulations on your safe land! that is sure a standout 1:6... beautiful! It certainly looks like a good figure. Also, how hard can it be to get internet connected these days? I swear if this NBN thing doesn't make it easier, it's a complete waste of money. the costumes and such are pretty swell. but i agree that whatever articulation details going on under the fabric make them look odd. check out those kneepads! 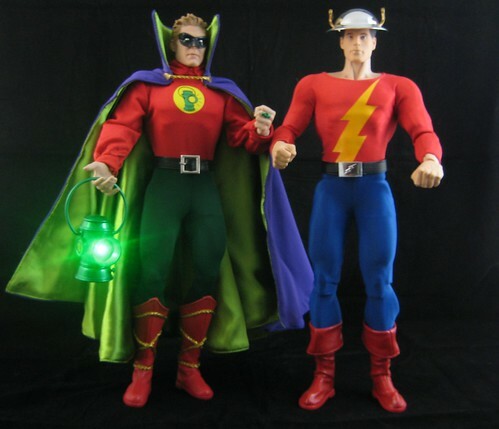 Fantastic looking figures i just digging Alan Scott who has always been a favorite of mine. Lordy...I'm about out of display space, but I must get an Alan Scott. Hopefully I can find a good deal or swap art for one. Loved him (and his costume) since he reappeared during the Silver Age. Any way good job. Merry Christmas!! Damn, Alan looks pretty good. They've put out some really good stuff in the last couple of years. It's a shame to see this line is turning into SuperBats variants now. Loving the light effect! Are his fingers always like that? THey seem unnatural to me (as far as an action figure goes anyways). That cape is ballin though.